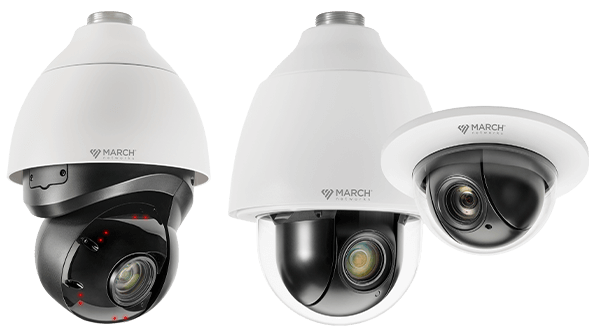 Learn about the newest additions to our IP video surveillance products portfolio. 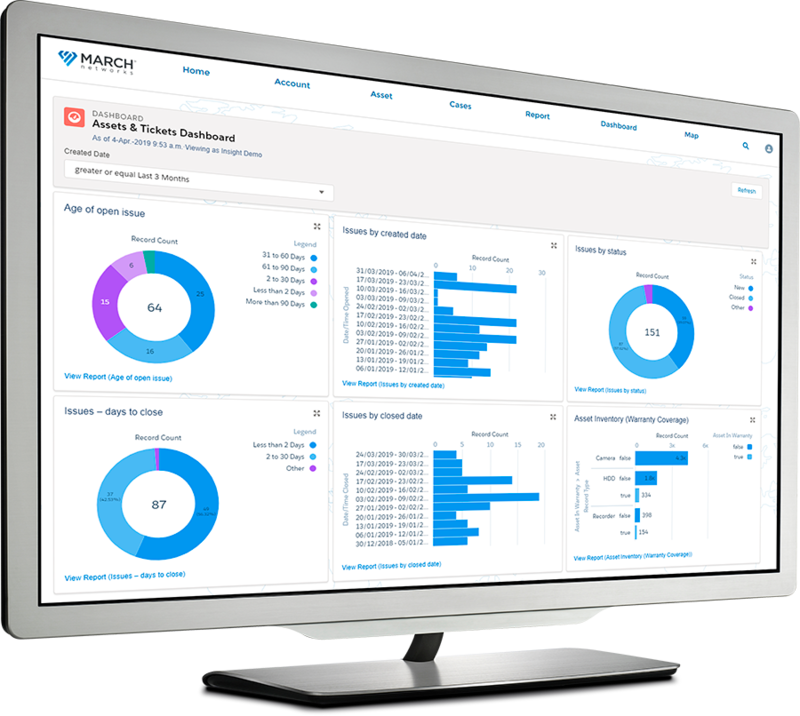 We are pleased to introduce March Networks Insight, a new, cloud-based service delivering unmatched video network visibility, asset control, system health, and service level agreement (SLA) performance management. The ME3 Pendant IR PTZ 40X – A 3MP PTZ camera with IR, High Dynamic Range (HDR) and built-in auto tracking, featuring 40X optical zoom. The SE2 Flush PTZ 30X and SE2 Pendant PTZ 30X – 2MP PTZ cameras incorporating 1080p resolution and 30X optical zoom for an impressive field of view. These cameras also feature PoE+ for convenient single cable installation and are IK10-rated for impact resistance when pendant mounted. Our 9000 Series IP Recorders are now available with RAID5 and hot swappable power supplies, for enhanced reliability and servicing. RAID5 support is available on up to 8 hard-drives, in combinations of 4, 6 and 8 drives. 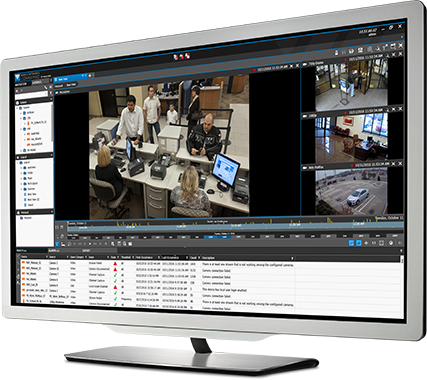 The latest releases of our Command, Visual Intelligence and Searchlight software are now available for download from the March Networks Partner Portal. We are pleased to add a new HD analog encoder to the March Networks product portfolio. The Edge 8e HD Encoder captures 1080p video from up to 8 analog and/or HD analog cameras, including March Networks CA2 HD analog domes. The encoder features built-in audio, alarms and PTZ controls, as well as up the coax (UTC) controls for convenient remote camera configuration. It supports AHD, TVI, and CVI HD analog video standards. Command Recording Server 128 is a high-performance solution for customers that prefer the convenience of a plug-and-play video management system (VMS). 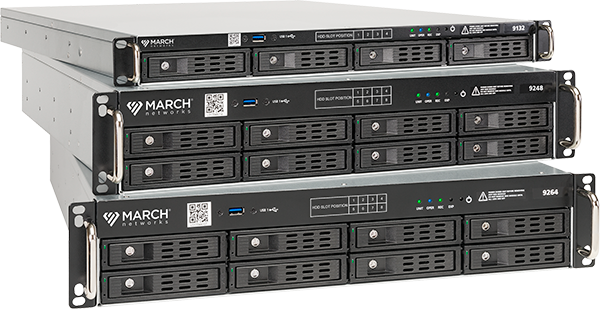 March Networks Command Recording Server software and the Microsoft Windows Operating System come pre-installed and tested on these servers for convenient out-of-the-box operation.